Like their friends in California before them, New Yorkers are showing a growing interest in the “bowls,” “toasts,” and farm-to-table food that defines this market. This is evident walking down any New York City street, where a salad chain pops up as often as a Starbucks. And with summer around the corner, we’re sure to see lunch lines at Dig Inn and Chop’t get even longer. Just Salad, which rebranded last year, expanded its menu to offer bowls, toasts, wraps, and more. According to QSR Magazine, by Q3 2017 the chain had experienced eight straight months of improved sales. Sweetgreen debuted much larger compostable salad bowls in 2017. While reactions to the bowls were mixed, the brand got a boost late last year when chef Danny Bowien of Mission Chinese Food and PBS series “Mind of a Chef” created a limited-time dish for Sweetgreen’s menu. Fresh & Co made news for acquiring a working 35-acre farm and announcing its intention to produce “farm-to-desk” food. A spokesperson for the company said the chain’s menu items will be entirely sourced from the farm. As these chains have made improvements, traditional fast food companies are also having to keep pace with shifting consumer behaviors and preferences. Even though industry experts say there’s still a desire for typical fast food items “that provide familiarity and comfort,” McDonald’s recently stopped listing cheeseburgers on its Happy Meals menu, reduced the serving size of its Happy Meal fries, and added water as a beverage option. All this buzz around healthy food trends got us thinking: is there any ‘ground truth’ behind this trend? 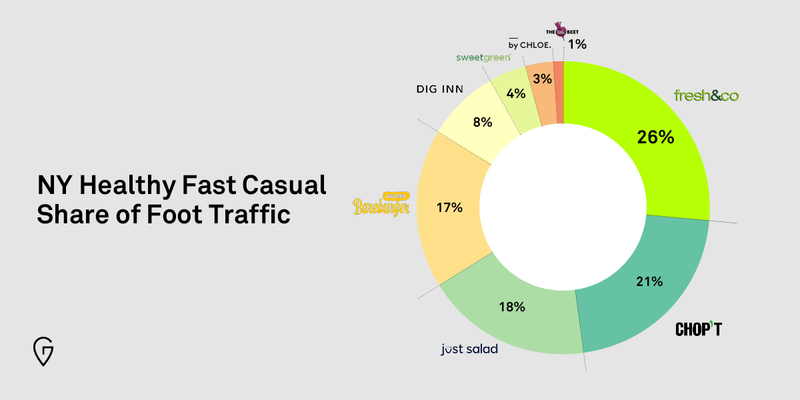 Does foot traffic patterns show a shift in preferences from fast food to healthy fast casual? The answer is yes. 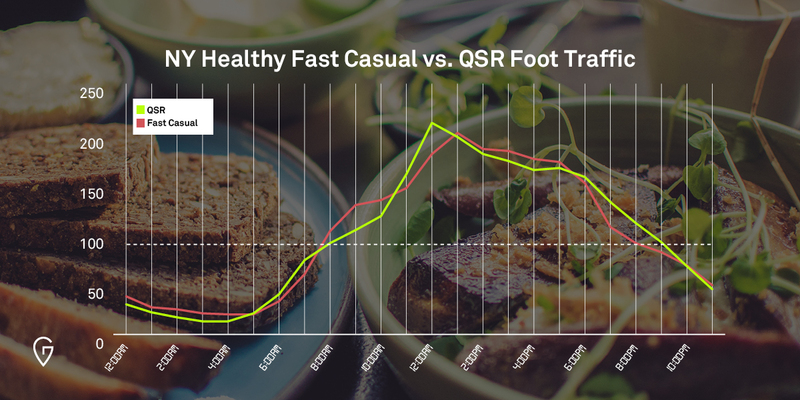 According to our location data, the share of healthy fast casual visitation in New York saw 49% MoM growth from December of 2017 to March of 2018, while both QSR and Casual Dining share of visitation are down 2%. There are some clear leaders blazing this new trail too. We found that Fresh & Co and Chop’t Creative Salad Company — which has stores in New York City; Washington, D.C.; Charlottesville, VA; and Charlotte, NC — hold the largest share within the healthy fast casual category in New York, followed closely by Just Salad. Meanwhile, a secondary trend has emerged: healthy fast casual is expanding into the breakfast market. Based on our Time of Day Visitation data, many New Yorkers like to start their day with a healthy meal. While the highest visitation to Healthy QSR locations is during lunchtime, visitation during breakfast hours (9 AM to 11 AM) is about 30% above average compared with the full day, and 20% higher than traditional QSR morning foot traffic. This suggests that expanding menu items to include breakfast is a good strategy, and explains why we’re seeing brands make this move. New York’s The Little Beet expanded to open its fourth Manhattan location, where it began offering breakfast in the form of multiple bowl options. Last year, Dig Inn, another farm-sourced chain with locations in New York and Boston, opened a two-story flagship store in SoHo where it’s currently offering breakfast, brunch, and a MatchaBar Cafe. 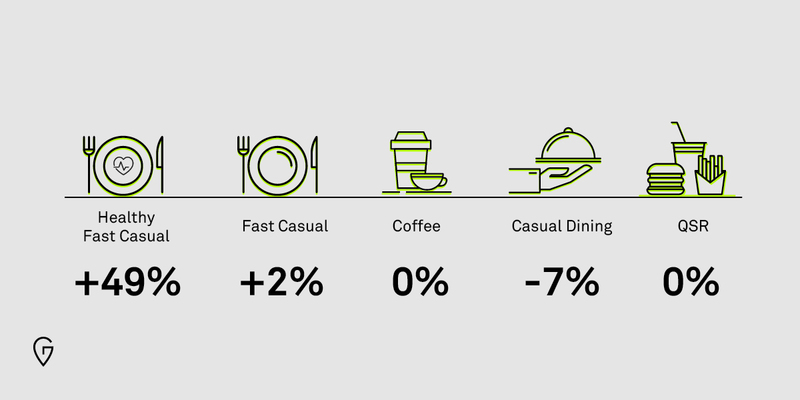 As the healthy fast casual craze evolves both in New York and beyond, we’ll continue to monitor foot traffic and consumer behavior data to identify the next big trend. In the meantime though, Shroomami bowl, anyone? Follow our blog for all the latest insights.